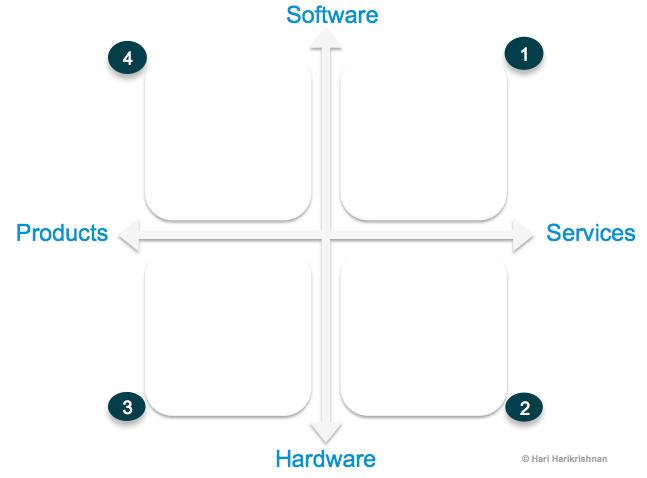 In Part I of this series of posts on business models, on whether we have new business models in the Information Technology sector, we looked at comparing business models using a Product-Service-Software-Hardware plane or PSSH Plane shown below, with quadrants representing the primary business models of firms. We examined the so-called “new business models” in the cloud era to see if there are indeed new business models. In this post, let’s extrapolate the PSSH framework for some insights in to another phrase that is thrown about in general conversations: Consumption Models. We’ll see how cloud & consumption relate to each other. Let me start by reflecting on some of my own patterns of consumption in the last few years. It is extremely rare for me to go to my favourite electronics retailer and pick up some software titles. I am reluctant to even download software to my computer if I can help it. I would rather use off-premise (“cloud”) software on-demand, much like streaming movies on-demand from Netflix. I am not yet there with hardware though. I still have laptops, desktops and tablets. I would love to subscribe to a virtual laptop service from Amazon and access it via my tablet, like many businesses that are using off-premise hardware rather than on-premise computing servers. Consider it my wish list, Amazon! What is behind this trend? Why do I have a reluctance to buy software or hardware? 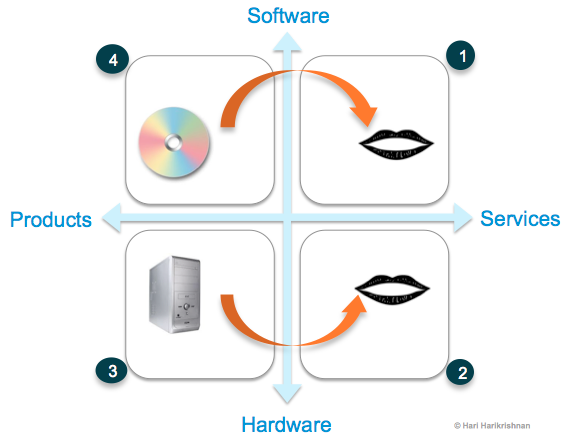 Cloud is the obvious answer, but let’s look deeper. In the first place, I am buying products to get some tasks done. If those tasks can be done without having to drive to a store, buy something, unpack it, install it, configure it, answer 20 questions in the process, shut it down, boot it up, tune it, debug it, update it, buy upgrades for it, why bother! I am not an expert system administrator nor a masochist. I try to apply core and context analysis to my day-to-day affairs. I would rather let someone else do all that work so that I can skip all the preparatory work and utilize the end-product to get my work done. That end product appears to easier to consume as a service — hardware or software made available as a service. For me, it is a compelling mode of consumption of things. Ubiquitous internet has made this possible. This graphic shows how my consumption has shifted right, from product to service. 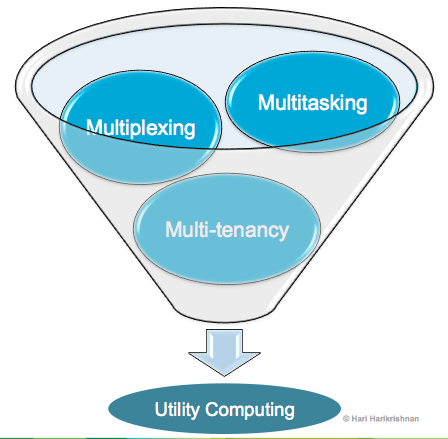 Yes, we’ve a new consumption model for technology, enabled by Cloud. It replays an old business model using a new delivery model. My laziness-induced consumption pattern has a profound impact on existing value chain. I used to buy products on retail, from stores. Instead, now I can buy services from firms that have transformed those products in to services. 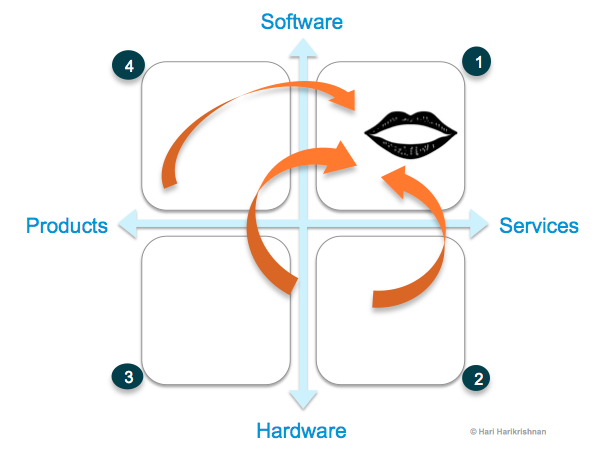 In the process, the provider of that service (a quadrant-1 SaaS provider in this example) has delegated firms in other quadrants to suppliers. Alternately, firms in quadrant-4 and quadrant-2 may move in to quadrant-1 to meet my consumption preferences. In either case, the effort that I would have spent to make a product usable has shifted to the service provider. 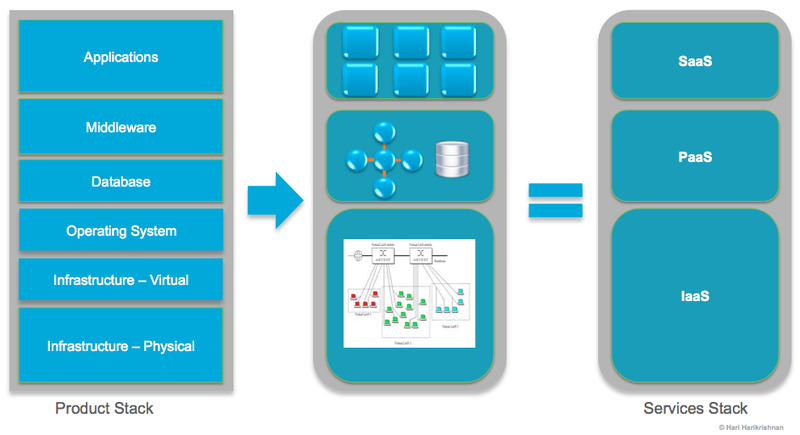 Can we use PSSH framework to understand business models of firms outside Information Technology sector? In order to do that we’ll break down some of the quadrant labels to more basic ones. e.g. Product can be any packaged good; Service is a combination of people (knowledge) and processes; Hardware could be brick & mortar facilities, silicon, food, glass, metal etc. The graphic below on the right shows a more basic PSSH plane. 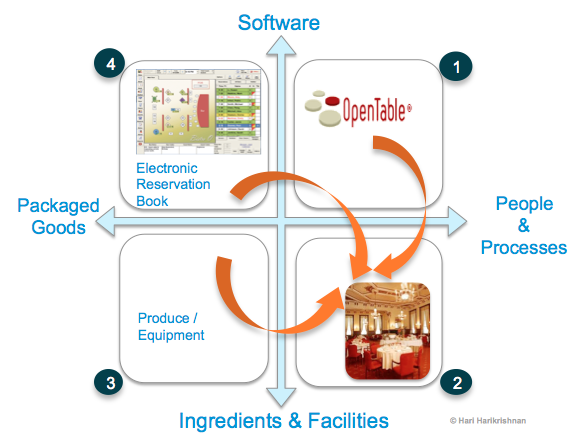 Armed with this, we’ll look at the age-old business of restauranteering and see how cloud is helping this business. How can one discuss consumption without talking about food! 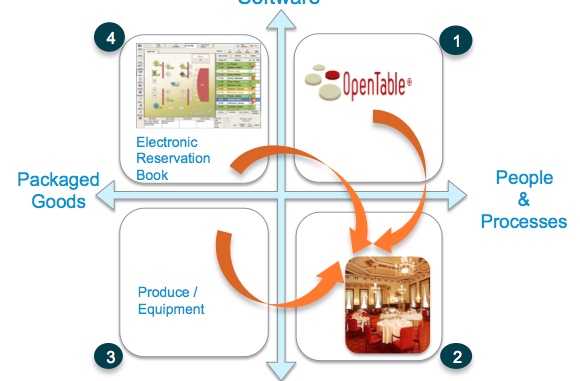 This graphic shows Electronic Reservation Book (ERB) software interacting with cloud-based software provided by OpenTable. I have placed restaurants in quadrant-2. In essence, restaurants are facilities-based service providers, turning ingredients, physical goods, facilities and people to offer a service. For me, services like OpenTable or Urbanspoon is a huge convenience and time-saver. To the restaurants, it drives demand and optimal filling of tables. There you have it, one of the oldest businesses, now cloud-assisted, depicted in the PSSH Plane. So, is there an inherent drive towards service consumption as opposed to product consumption? To analyze this, let’s reflect on the difference in literal consumption when most of us eat at home vs. when we eat out at a restaurant. The former involves lots of purchasing, unpacking, preparing, tasting, discarding, and not to mention, cleaning-up. On the other hand, going to a restaurant is about consumption without all that hassle. When we eat out, we are opting against buying products and making it ready for consumption ourselves, in favour of paying for a service. Does it all sound similar to buying a technology product and having to baby-sit it to get it to work vs. consuming technology as a service? Will Cloud allow technology consumption to be less onerous than it has been in the last century? Further, will the cost savings that Cloud promises mean that consumption of technology as a service will not be as expensive as eating out every day compared to cooking at home? See Part III of this series to see the blurring lines between service and technology and how service morphs in to technology, using the PSSH plane.